128,264 visitors turned up at CHINAPLAS 2015 despite bad weather in Guangzhou last week, the organizer, Adsale Exhibition Services Ltd. announced. Of the total visitors’ number, 35,090, or 27.36% came from abroad. 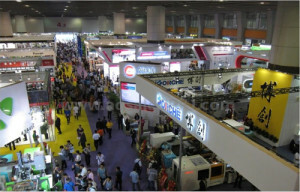 It was the second highest attendance in the show’s history, which was a “pleasant surprise”, according to Stanley Chu, Chairman of Adsale Exhibition Services Ltd, who admitted to have a lower expectation this year due to the slowdown of Chinese economy. “It seems we have to bear with this new normal for the coming years. That is, slower export, higher production costs, strong RMB, lacking of workers in the coastal industrial zones and an urgent need to upgrade its industry for China in general,” he said. Mr Chu was particularly pleased to see not just a strong attendance but also the rising quality of visitors. His sentiment was echoed by Mario Maggiani, Managing Director of Assocomaplast, who was responsible for organizing the Italian Pavilion at CHINAPLAS. “From what I heard from the Italian exhibitors, they are really pleased to see so many visitors, and their quality have improved significantly,” he said. This year, there were a total of 3,282 exhibitors coming from more than 40 countries and regions, occupying 240,000sqm of space in Guangzhou. It represented a 4% growth in scale compared to CHINAPLAS 2014 in Shanghai and was 9% bigger than its previous edition in Guangzhou two years ago. With the size of the Chinese manufacturing sector we could have easily added tens of thousands sqm of exhibition space, Mr Chu said, but his aim is to further bettering the quality of the fair rather than on its number. For this reason, Adsale has been partnering with Messe Düsseldorf since 2005, who is the organizer of K, the world’s No.1 plastics industry trade fair. “We are confident that CHINAPLAS 2016 – the 30th edition of CHINAPLAS, will reach its historical height,” he summed up. Ada Leung, General Manager of Adsale, added that there will be a brand new image to greet all audience in Shanghai next year, along with various activities to celebrate this historic moment.